In 1953, the world was introduced to America’s sports car, the Chevrolet Corvette. Eventually, the Corvette would become the standard-bearer for American automotive know-how, but for the first few years, sales were rather disappointing. In 1955, GM was even considering cancelling production, but GM gave the Corvette one more shot with a new V-8, and it worked. In a few short years, the Corvette would be dominating race tracks and drag strips from Riverside to the Circuit de la Sarthe. 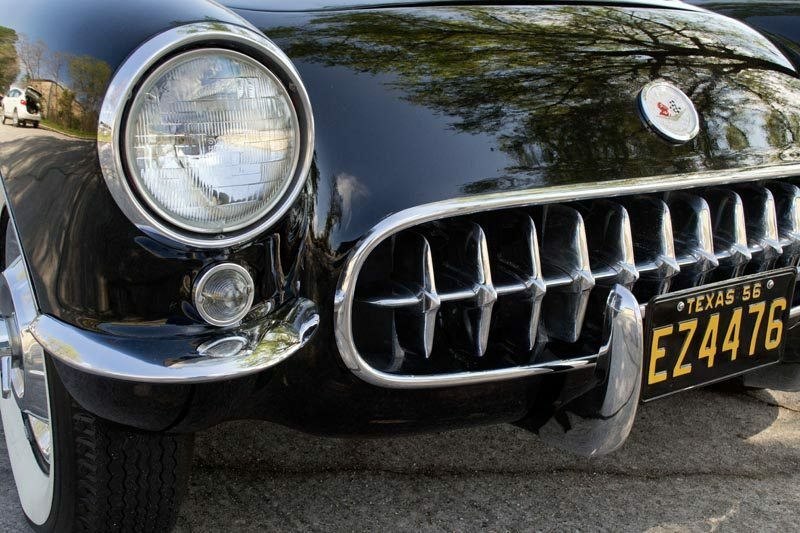 Conceived by Harley Earl, the Corvette was meant to compete with the European sports cars favored by American G.I.s returning from service after World War II. 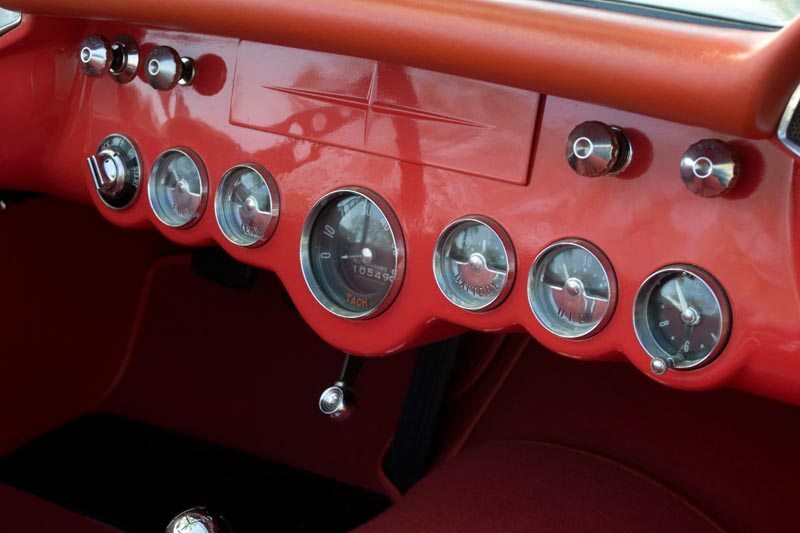 The original Corvette was an exceptionally attractive car, but performance was lacking. Chevy’s Blue Flame Six and Powerglide automatic transmission simply could not compete with the offerings from Ferrari and Maserati. The influence of Zora Arkus-Duntov would change the course of the Corvette forever and rescue it from flagging sales. 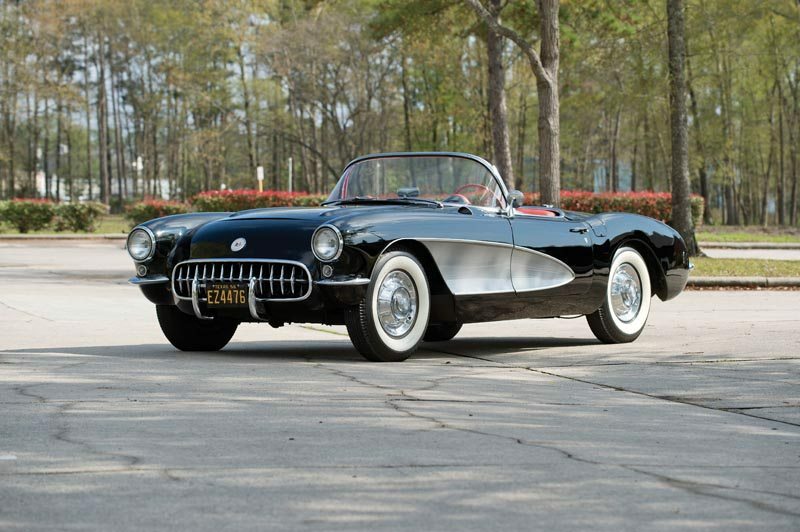 Duntov championed the use of Chevrolet’s new V8 engine in the Corvette, and by 1956, the Blue Flame Six was banished back to the economy-car parts-bin from whence it came. 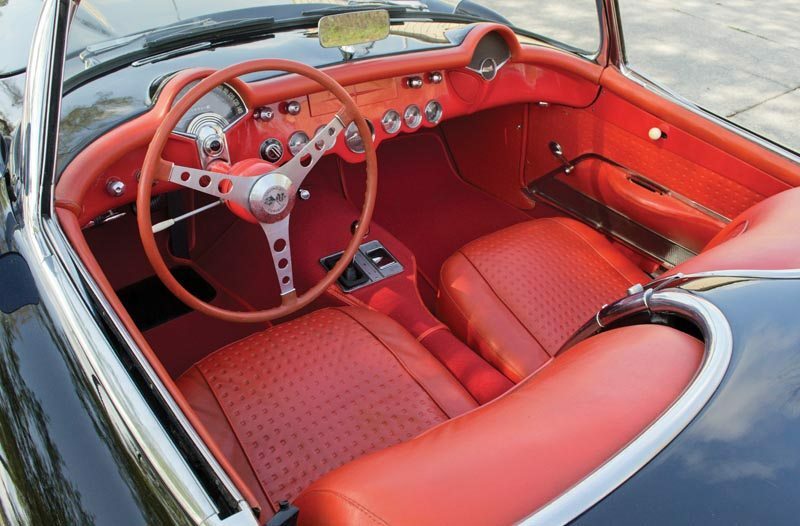 In the minds of most Corvette historians, 1956 marked the arrival of the Corvette as a true, award winning sports car. In January of 1956, General Motors shipped their new powerhouse to Daytona where it set production car speed records at more than 145mph (233kph) with the new 265 cu in V-8 pushing out 225 hp. Purposeful bodywork, penned by Bob Cadaret, announced the sporting intentions of the once docile roadster. 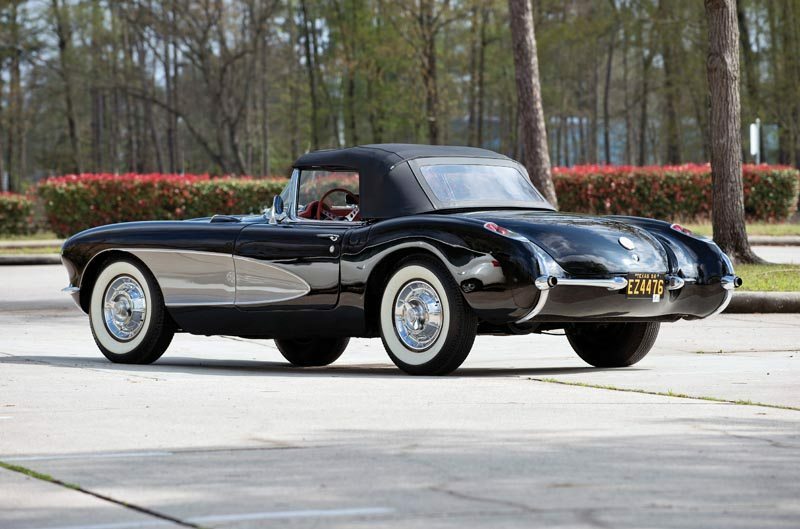 1956 was also the first year for the iconic “coves” that would become a Corvette hallmark. A new and much improved convertible top was added along with roll-up windows and exterior door handles. Finished in the factory black with silver coves, this Corvette is slightly more understated than many produced in the era, yet it maintains an unmistakably sporting character. The panel gaps and finish remain in fine condition throughout, and all of the chrome and tasteful brightwork follow suit. Slide inside, and the sharp red leather interior matches the factory selection, and with new carpets, it really stands out against the black and silver motif. The factory three-spoke steering wheel, gauge package, and three pedals make it clear that this is a very purposeful sports car. 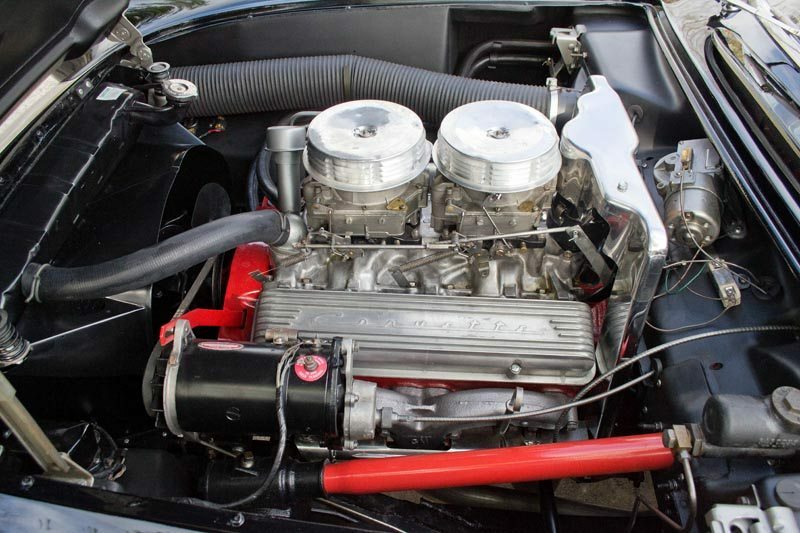 Power is provided by a 265 cu in V-8, and the first owner checked the box for Option 469, which added a second four barrel carburetor to the engine and a taller “Duntov cam” for a 15 HP increase to 225. It’s a noticeable bump in performance, and mated to the correct 3-speed transmission, it’s one of the quickest cars of it’s era. The engine bay matches the rest of the car – fully correct and nicely detailed, and the car operated beautifully as we photographed it near Houston. The records that accompany the car indicate ownership from new, including the current caretaker, who has owned the ’56 since 1999. He spoke with the previous owners, who all indicated the car has never sustained an accident, and has assembled a thorough package of original documents on the car, including manuals, sales brochures, the Engineering Achievement Manual, receipts, and title copies. Always considered to be one of the best looking Corvettes, 1956 also marked the third-lowest production total in Corvette history, adding rarity to this example. As offered, this nicely equipped example is fully capable of earning a top position on any show field, or simply enjoyed as one of the nicest weekend cruisers you’ll find. Providing the excellent feel that only a well-preserved car can deliver, this landmark Corvette simply demands close attention from committed Corvette enthusiasts and marque collectors alike.